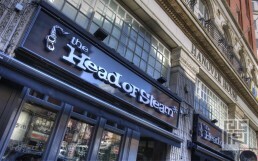 ‘Head of Steam’ Liverpool was a newly acquired site for our long-standing client, Cameron’s Brewery, and is based in Hanover House within a Grade II listed building in Liverpool. 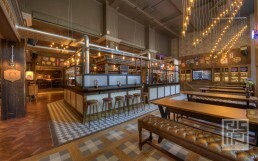 A major consideration for this project was reconfiguring the internal layout to suit the heavy drinks directed concept of the ‘Head of Steam’ brand which is led by a world beer offer. A key factor in the scheme was the creation of a new focal ‘island’ bar which would offer an extensive cask ale and keg range. The client team were keen that we introduced flexible seating into the layout for the inclusion of a new brunch food offer to add to the Great British pub menu that the brand already provides. The Fusion By Design team worked closely with the client team to develop the concept for this new site, to ensure it was sympathetically implemented within the confines of a Grade II listed building in the city centre. The ‘Head of Steam’ brand makes reference to the steam industry and the locomotive, however with this scheme we expanded upon this to include the dockyard and steam liners that are synonymous with Liverpool and its industrial heritage. The creation of the central ‘island’ bar required significant coordination and a large portion of the budget. New overhead exposed galvanized ductwork which houses the beer pythons adds an element of industry and theatre whilst also needing considerable planning within the bar servery. The result has created, with mild steel overbars, a true craft beer servery worthy of many world ales. Worn timbers accented with details continue the locomotive inspirations. 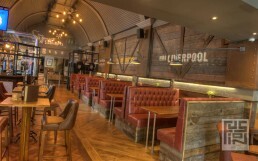 Timber panelling with patinated steel, emulating the traditional goods wagons of both the railway and dockyard, adorn the walls above the booth seating. Reclaimed railway sleeper timbers and hard-wearing leathers are used to create comfortable fixed seating booths in a train carriage inspired layout. We have included comfortable snug areas to form pockets of relaxed seating for private beer tasting or informal menu sampling. The selection of industrial inspired light fittings and rope details continue to echo the steam liner and dockside identity of Liverpool’s past.